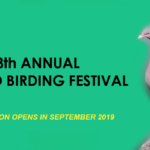 The 7th annual Birds of the Brush Art Contest guidelines are now available. Please download the file below OR click through the slideshow to view the contest rules. The contest is open to all ages and deadline for entries is January 12, 2019. For more information, please call the RGISC office at (956) 718-1063. Each day, birders will have a chance to select from a variety of full-day scenic trips. 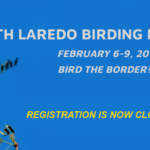 Escorted by professional field guides and members of our local Monte Mucho Audubon Society, birders will have an opportunity to deepen their birding knowledge of South Texas, and explore areas along Laredo’s riverfront, creek systems, nature trails and private ranchland.